Use this compression tubing end cap with black insert to close the end of our 1/2" poly tubing with .700" OD (outside diameter). 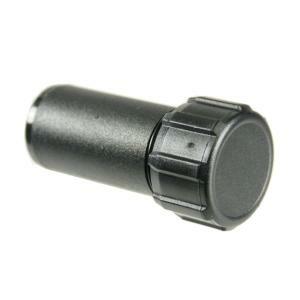 Unscrew 3/4" hose thread cap to flush or drain tubing. Often used by irrigation contractors, compression fittings are very economical and do not require clamps or gluing. Because of this, the fittings can be more difficult to install and are not removable/reusable. Compression fittings install over the poly tubing and are size specific for your tubing outside diameter.